Gregor qualified from the University of Glasgow in 2001. In 2004 he was awarded membership of the faculty of dental surgery from the Royal College of Physicians and Surgeons Glasgow. 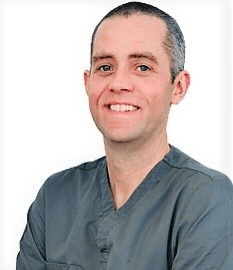 Since qualifying Gregor has worked in a variety of dental specialities including oral and maxillofacial surgery and paediatric dentistry, in Glasgow, Liverpool and Northern Ireland. Gregor joined the team at Rosconnor Specialist Clinic in 2017. His interests are in the surgical and restorative aspects of helping rehabilitate patients with dental implants. He is also committed to continual professional development and in developing cultural change in bridging 'the gap' from theory to application in dental practice based education.